Welcome to the Computing page! "Computers themselves, and software yet to be developed, will revolutionise the way we learn." Computing is the subject title that covers the teaching and learning of specific computer skills, with an increased focus on computer programming. All children from Year 1 to Year 6 have one Computing session per week with access to laptops and iPads to carry out their work. We have recently increased the number of devices available during these sessions so every child in class can work on a notebook computer. New for 2018- Purple Mash has arrived! We are delighted to announce that we now subscribe to the fantastic Purple Mash software and will be using this in Computing sessions, as well as for cross-curricular ICT! All pupils have their very own Purple Mash login and can also access their work from home. Teachers may set additional activities for optional homework, which children will receive in the 'alerts' on the website. They can also 'hand in' work and check what feedback they have been given, providing a fully interactive approach to learning! Purple Mash provides software to cover all areas of the Computing Curriculum, from coding to spreadsheets to blogging to e-safety... and everything in between! We are all really enjoying using it so far! Scan this QR code to see some of our work! You can find links to our Computing Curriculum Overviews at the bottom of the page! Our Digital Leaders have yet to be chosen this year, but when they are selected they will be attending an afterschool club that allows them to stretch their Computing abilities and engage in small focused group work that will challenge their creativity and skill. At the end of these sessions, our Digital Leaders will produce something to present to the school. In previous years, we have had a wonderful e-safety presentation, e-safety brochures produced and this year promises to deliver something a little more "animated". Below are two examples of our efforts to spread good e-safety etiquette whilst using the internet. Specifically focusing on the SMART rules from the kidsmart.org.uk website. Alongside our computing lessons, the children at Birkdale Primary will be enjoying the Hour of Code event, which will take place between 3rd and 9th of December this year nationally. Children will be given an hour throughout all classes to produce something using the provided software. This year we will be coding on our netbooks, laptops or iPads. Hour of Code is always a fun event that the whole school takes part in! Code club will be taking place in the Summer Term this year and promises to be another fantastic success! Just like last year, children from across KS2 will take part in sessions where they are able to create their own computer programs and games using Scratch and Purple Mash software. They will also enjoy programming our school robot, Elvis, and teaching him some new moves! E-safety is an important part of our Computing/ICT and PSHE curriculum. This aspect is built in to our computing sessions and is also taught discreetly in a block during the Autumn Term. We are learning how to stay SMART online! 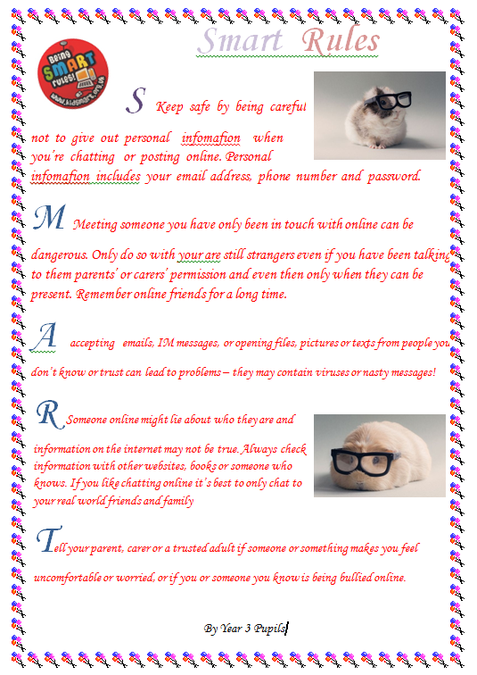 Over the years, the children have also been introduced to the kidsmart.org.uk SMART rules and the SMART crew who live by these rules. They set out 5 easy steps to staying safe online. You may wish to print the SMART rules out and display them somewhere that will act as a constant reminder for your children (the fridge maybe?). If you have any concerns about your child's safety online then we recommend you attend our e-safety sessions for parents. Our next session will take place in Summer Term 2019! Parents who attended our last session, with guest speaker Jo Hodge, found it very informative. If you are looking for some advice immediately then feel free to come into school and discuss your concerns with your child's teacher or seek help from the CEOP (Child Exploitation and Online Protection) website who have helped many families deal with e-safety issues. Additional downloadable resources will be made available below. Here is a short video the children made in Year 6 for an e-Safety competition that we attended at Edge Hill last Summer. I can't wait to see what we come up with this year!